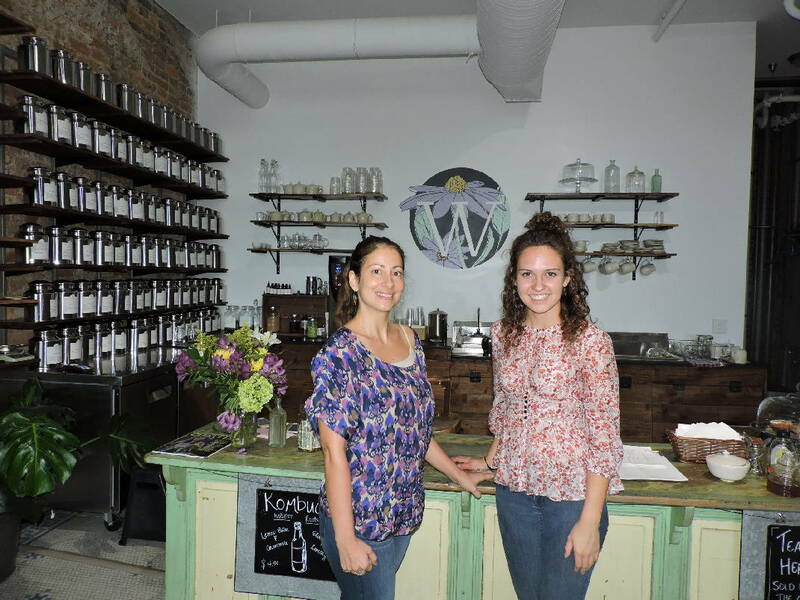 Wildflower Tea Shop & Apothecary owner Hillary Libby, left, and "bateatrist" Kelsey Porter welcome people to the new shop in downtown Chattanooga. Hours of operation are 10 a.m. to 6 p.m. Monday-Saturday. Call the shop at 803-2625 to learn more. Wildflower Tea Shop & Apothecary is newly open across from the Chattanooga Choo Choo, at 1423 Market St.
Shop owner Hillary Libby is a yoga instructor and holistic health coach on the side, so she decided to leave her 10-year corporate career in pharmaceutical sales for something more aligned with her yoga and holistic health interests, she said. "As a yoga instructor and holistic health coach, I would find myself recommending certain herbs and teas to people and there was nowhere in town to buy it," Libby said. "I found myself traveling to get these things or ordering it on the internet. I'm very intuitive. I ask people, how do you feel? And, how do you want to feel? Chances are there's a tea for that. There's teas for so many things." For example, she said, there are energizing teas, relaxing teas and teas that promote overall wellness. "Citrus green tea is served here," Libby said of her shop. "Green tea is full of antioxidants. It's good for a burst of energy, but not a spike like you might have with coffee. Green tea is more subtle. It gives you energy, but it's a boost." She personally likes to drink a matcha latte. "...Matcha is powdered green tea," she explained. "It's intensely green and very high in antioxidants. Again, it's energizing with anti-cancer properties and energy in green tea. It's intensified because you drink the whole leaf. We have a ton of herbal teas for various things here." In addition to various teas, the shop carries Wooden Spoon Herbs sold in bulk and by the ounce, as well as ceramics handmade by Annie Hanks. "I want to help people feel better," said Libby. "This is my way of doing that. Apothecary is what drugstores used to be called back when plants were used to remedy us. Apothecary is getting back to our roots and enjoying healing plants." She said she employed the same wellness mentality when renovating the space. "This space was created to be good for your body and soul and to relax and destress. I'm all about mind, body, spirit and wellness," Libby said.